Lake McDonald Lodge (veranda on lake side), Glacier NP, 1985. Lake McDonald Lodge is a three-and-one-half-story structure built on the eastern shore of glaciated, picturesque Lake McDonald. The only structure included in this Landmark nomination is the main lodge building. The guest cabins and ancillary structures built prior to and after the main lodge was constructed are included in the National Register as part of Lake McDonald Lodge Historic District but are not included in this nomination. The lodge building has a rustic, Swiss-chalet style with clipped gable roofs, balconies on the upper stories, and jigsawn detailing. Principal building materials for the structure are stone for the foundation and first-floor walls, with a wood-frame superstructure. Some of the interior structure around the lobby and first-floor porches is heavy-timber framing. The main wing at the north end of the building is generally rectangular in plan and contains the impressive lobby, gift shop, cocktail lounge, and a few guest rooms. The main gable is intersected at the north and south ends with perpendicular clipped gables that contribute greatly to the building's chalet character. The two upper stories contain guest rooms. South of that main portion are the dining-room and kitchen wings of log and wood-frame construction respectively, with poured-concrete and concrete block, and stone foundations. The dining-room wing may pre-date the rest of the lodge. These one-and-one-half-story wings have low, intersecting gable roofs and minimal detailing so that the viewer's eyes remain drawn to the Swiss feeling of the main lodge building. The multiple roofs of the main lodge section, and the kitchen and dining-room wings are finished with wood shingles. The originally exposed stone walls of the first floor are now finished with off-white stucco. The upper stories are finished with wood clapboarding painted brown. Bands of painted wood decoration wrap around the structure and visually separate the different floor levels. The building's multiple balconies and verandas also contribute to the chalet feeling. On the east side of the building at the entrance, the posts edging the veranda and supporting the upper balcony are heavy milled timbers with bracket-type capitals. On the west side, the veranda facing the lake has log post-and-beam construction. The rustic feeling is reinforced by the bark that remains on the logs. Over time the balcony railings of milled lumber in lozenge patterns have replaced the original rustic log railings on the west side. Those on the east side that were originally milled lumber in a series of simple vertical balustrades have also been replaced with lozenge-pattern railings. Windows in the main section add architectural interest to the structure. Those in the stone walls are segmentally-arched openings with paired, multi-light wood casements. Those on the second and third stories are paired, multi-light casements, while those in the attic gable ends are multi-light casements with a low, horizontal emphasis that reflects the available interior space. In an architectural sense, the front elevation of the building is actually the side facing the lake. Entrances on the east side that allow access to the building's lobby do not have the strong architectural emphasis that usually defines a front entrance to a major hotel. The lobby is the most architecturally significant space in the structure. The concrete floors are scored in imitation of flagstone and have incised messages in Blackfoot, Chippewa, and Cree that translate into phrases such as "welcome," "new life to those who drink here," "looking toward the mountain," and "big feast." The lobby is a large, open space three stories in height. Balconies surround the upper portions of the lobby on three sides. In each corner of the lobby are a trio of tall cedar columns that stretch uninterrupted from the ground floor up to the third story, where they are topped with round capitals cut from slightly larger logs that in turn support the exposed roof structure. Additional log beams and brackets support the balconies. Railing-s around all of the balconies are logs in a repetitive patterns reminiscent of Stick Style railings. The main structural logs of the lobby retain their bark. On the east wall of the lobby an inglenook-type fireplace of enormous size has Indian designs scored and painted in the masonry above the opening. The lobby edges of the inglenook are surrounded with a log framing similar in design to that of the rest of the lobby. Directly above the fireplace is a large multi-light window that allows considerable natural light into the lobby. The chimney for the fireplace is off-set to the north and is visible on the structure's exterior. The staircases from the lobby to the upper stories have gnarled log newel posts and jig-sawn railings. All of the guest room doors and hallway entrances are framed with a dark-painted wood molding that extends in L-shapes from the corners, again contributing to the rustic Swiss detailing. Some of the doors are replacements of the original. Guest-room interiors have been updated several times but generally retain original configurations. The dining-room contains considerable original fabric, although the room sustained considerable damage during a flood in 1964 that destroyed the original fireplace. The exposed log walls, posts, corbels, and beams along with the original furnishings give the room a particularly rustic appearance. The large plate-glass windows on the west are not original. Many original furnishings remain in the building. The rustic hickory-type chairs and tables in the lobby and west-side porch are original. The Navajo rugs and mission-style furnishing have been removed. The trophy heads and other mounted hunting trophies are original and a distinctive part of the lobby furnishings as are most of the paintings. All of the hunting trophies are from the personal collection of John Lewis, the first owner of the hotel. Also of significance are the chandeliers and sconces of Indian design. Changes to the building over time have not marred the structure s architectural integrity and have been relatively minor. Guest-rooms were added to the second and third floors on the west side of the lobby in 1934 at the same time that the transportation desk and newsstand were built. The present loop road for dropping off guests and flagstone steps were constructed in 1935. In 1958 all of the building's bathrooms were updated. The gift shop, cocktail lounge, and registration desk and office were added at the same time. The kitchen underwent major rehabilitation in 1959 and even received a new roof structure. In 1964 the kitchen and dining-room were remodelled as a result of flood damage, and the dining-room was expanded. Lake McDonald Lodge is one of the finest examples of a Swiss Chalet hotel remaining in the United States. Others of that category include the remaining two hotels and chalets in and near Glacier National Park. On a local level of significance the construction of the Lodge played a major role in the development of facilities on the park's west side. Lake McDonald Lodge, also known as the Lewis Glacier Hotel, is the second hotel on its site. The first, the Glacier Hotel built by George Snyder, was constructed in 1895. In 1913 a land speculator named John E. Lewis of Columbia Falls, Montana, who had acquired the property in 1906, hired the architectural firm of Kirtland, Cutter, and Malmgren out of Spokane, Washington, to design a new hotel that, in his words, was "something worthy of the park." The architectural firm, responsible for a number of hotels and commercial buildings in the Spokane vicinity, drew upon the same architectural sources as had the designers for the Great Northern Railroad: the Swiss Chalet style tempered with rugged natural materials that contributed to a frontier feeling in the architecture. The Great Northern Railroad between 1910 and 1915 was in the process of building a series of hotels and backcountry chalets in and around the newly-created (1910) park. John Lewis saw the need for a major hostelry on the shores of Lake McDonald, the largest lake in the park, and built one to rival the Great Northern buildings elsewhere in the park. The design for the hotel was patterned after a large Swiss Chalet, with a stone ground floor, and wood frame construction above. The Swiss detailing on the interior and exterior were quite evident. The lobby contained the enormous log columns and multi-story balconies, similar in thought to the Glacier Park and Many Glacier Hotels constructed about the same time. In a larger sense all of those hotel designs harkened back to the Northern Pacific's Old Faithful Inn at Yellowstone in terms of the enormous multi-storied lobbies and the heavy use of natural materials, although the spaces created were extremely different. At the time the Lake McDonald Lodge was constructed, private developers such as Lewis, and large railroads like the Northern Pacific; Atchison, Topeka & Santa Fe; and the Great Northern were beginning to construct "destination resorts" in areas of exceptional scenic value--areas that were national parks or that were proposed as parks. The railroads saw the venture on a strictly commercial basis. They wanted to lure American tourists back from Europe by providing resorts of equivalent comfort in areas of spectacular American scenery. Through time the railroads greatly increased revenues from passenger traffic by supporting developments like Old Faithful Inn at Yellowstone, or El Tovar at the Grand Canyon. The designers for the railroads became quite adept at creating in their architecture the "image" the railroads needed to provide distinction to the resorts. After all, the railroads wanted to create places worthy of "writing home about"--places where the hotels were nearly as memorable as the scenery. In the instance of Glacier National Park the architects leaned heavily on the Swiss alpine traditions for inspiration. They considered the chalet style appropriate for this mountainous area so similar in scenic values to the Swiss Alps. Private developers such as John Lewis had to provide accommodations of equivalent luxury to stay in business. In this instance the private developer also competed with the railroad in terms of style. The concrete and stone foundations of the Lodge were completed before the winter of 1913, and work proceeded for ten months on the building. Building materials were transported to the site by boat during the summer months and skidded across the ice during the harsh winter. Quite naturally the building's most important elevation was at the west and faced the lake, since visitors arrived at the area by boat until 1920 when the road was constructed. The building was sited on a small rise above the water near the north end of Lake McDonald. Creating a suitable architectural entrance for the east elevation was never done, giving visitors even today the gnawing feeling that they are entering the rear of the structure, rather than the front. The hotel opened for business in June, 1914. In 1930 the Glacier Park Hotel Company, a subsidiary of the Great Northern Railway, acquired the concessions~ rights to the structure. The Great Northern's acquisition of the concession rights of the hotel not only completed their monopoly of all major lodging at Glacier National Park, but it also fit the Swiss alpine image they worked so hard to create. 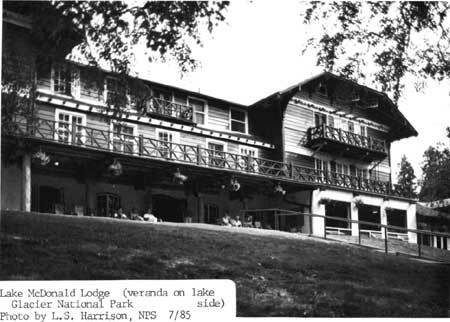 The name was changed to Lake McDonald Lodge in 1957. Today the building's lakeside elevation remains as picturesque as it was when the building first opened. The exterior retains its heavy European character. The remarkable lobby contains a strong American feeling where "frontier" materials were worked into a space of high-quality of craftsmanship and rustic design unique to the American west. Historical Research Associates. Historic Resources Study, Historic Structures Survey, Glacier National Park, Montana. Denver: National Park Service, Denver Service Center, 1980. McDonald, James R., Architects P.C. Lake McDonald Lodge, Glacier National Park, Architectural Preservation Guide. Denver: National Park Service, Rocky Mountain Regional Office, 1984. Sheire, James W. Glacier National Park Historic Resource Study. Washington, D.C. : National Park Service, Office of History and Historic Architecture, Eastern Service Center, 1970. Tweed, William, Laura E. Soulliere, and Henry G. Law. National Park Service Rustic Architecture: 1916-1942. San Francisco: National Park Service, Western Regional Office, 1977. The boundary begins at a point on the access road at the northeast corner of the intersection of the road and the Lodge driveway; then proceeds southwest approximately 300 feet to the northeast edge of Snyder Creek; then follows the creek edge in a northwesterly direction to the shoreline of Lake McDonald; then follows Lake McDonald shoreline in an easterly direction to a point 100 feet north of the north corner of the lodge; then proceeds southeast in a line 15 feet out from and parallel to the northeast wall of the lodge to the outside edge of the driveway; then easterly along the edge of the driveway to the starting point.